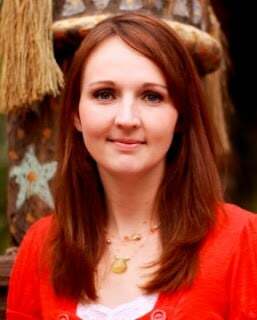 My time at the Roy E. Disney Animation Studio’s was some of my favorite from my trip to Los Angeles. 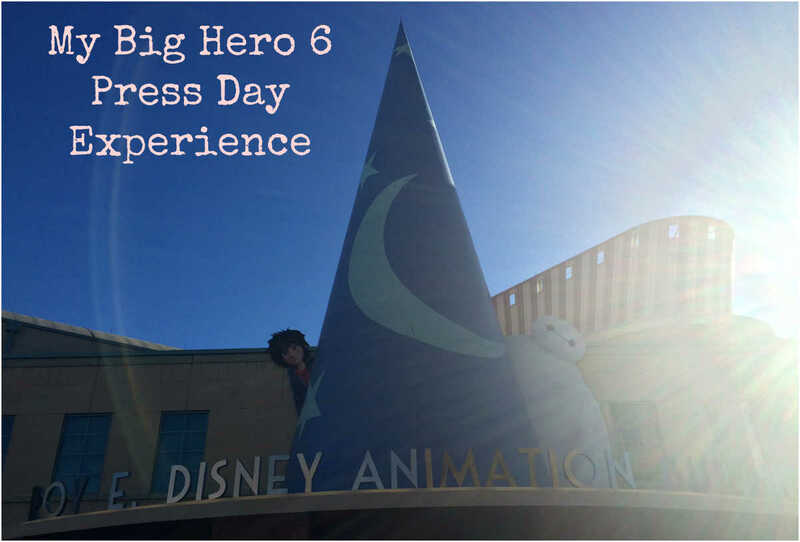 This is where I was able to get the real behind the scenes experience with how a Disney movie is made. I had the opportunity to interview the directors and learn all about the process, become the voice of Baymax (this awesomeness requires its own post-coming soon), and learn how to draw Baymax. 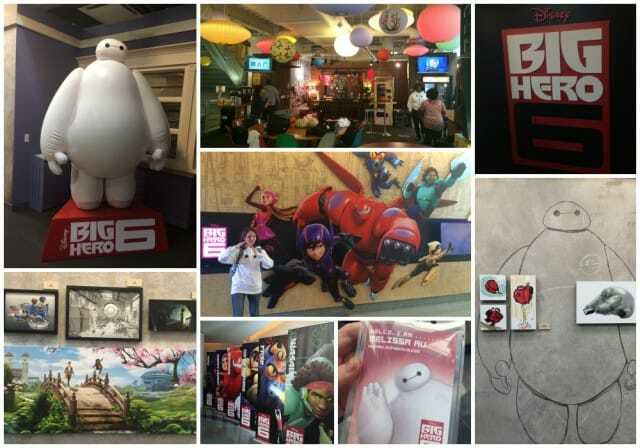 I hope that you have already seen Big Hero 6 because it really is such a fantastic movie. I was so excited about seeing the movie on the Red Carpet that I came home and took my kids to see it opening weekend. I love learning the behind the scenes features to movies because it really truly helps me to appreciate the movie even more. But first off, aren’t we adorable in our Baymax sweatshirts! 🙂 I was able to spend the day at the Animation Building with these awesome bloggers and took these awesome jumping photos. I jumped so high when these photos were taken. Probably the highest out of all of the other bloggers, but when I received the photos, my feet were on the ground on every single one of them. Hahaha. I so don’t have jumping skills! 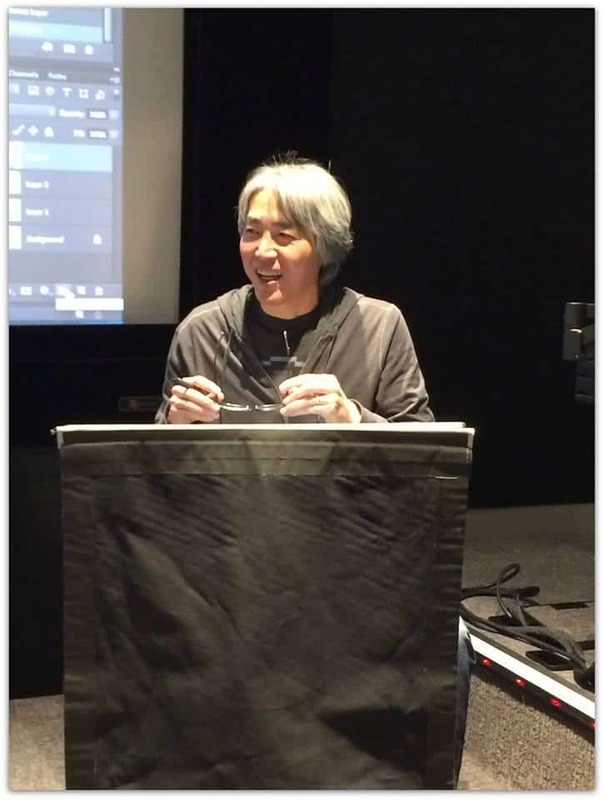 Director Don Hall was first attracted to the Big Hero 6 title. He saw the Japanese superhero theme, thought that was super cool, and then read the books and was really struck by the characters. Everyone on the film was really taken with the idea of a kid who was going to lose his brother and who would be left with his brother’s robot, a surrogate big brother, to help him move on. Other than Baymax (everyones favorite character) Chris Williams identified a lot with Fred. They knew from the beginning that there would be no super heroes. It’s going to be real people, and their superpower is gonna be super technology. Baymax was though of as more of a character than as a robot. I loved watching Big Hero 6 again after having this interview with the directors because I was able to recognize things about the movie that they had talked about. I felt having this experience gave me a great connection the story because I knew more about the time, heart and passion that went into making it. If you haven’t had a chance to see Big Hero 6 yet, I highly recommend it! As part of the Big Hero 6 Press Day I had the opportunity to learn how to draw from Jin Kim, he Character Design Supervisor on BIG HERO 6. 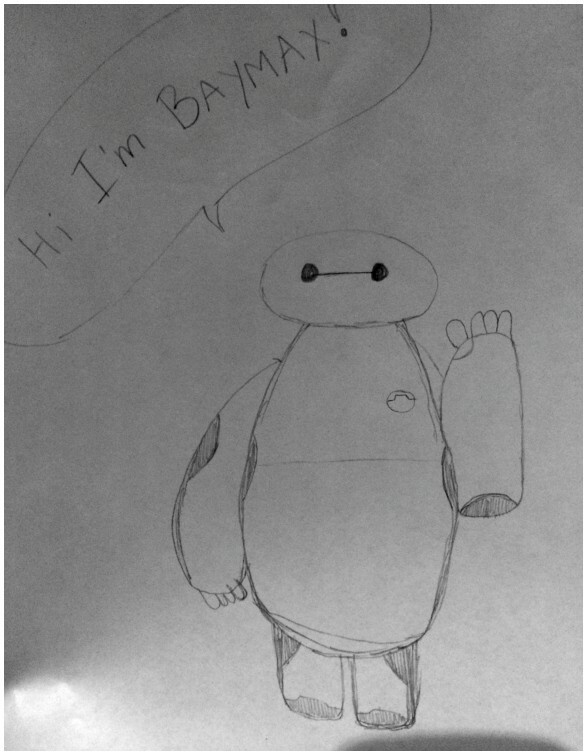 He was very talented in drawing Baymax and could do it really fast. 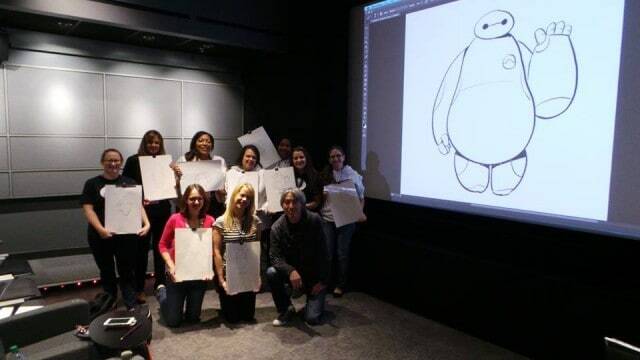 I imagine that is because he has probably looked at Baymax and drawn him thousands of times in making the movie. 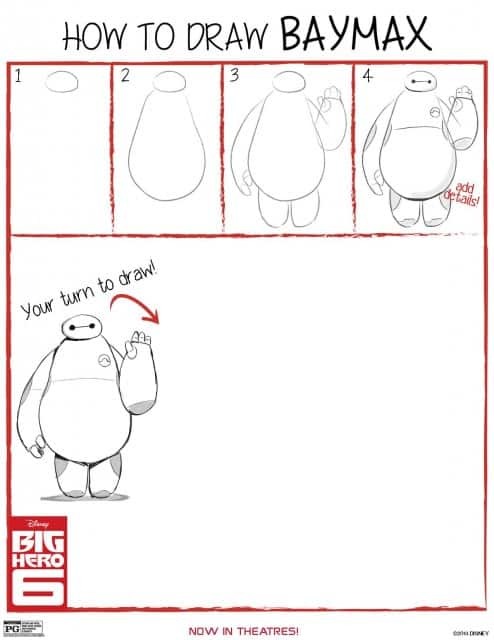 He went step by step showing up how to draw Baymax. It was fun seeing a group of us following the same directions, drawing the same character and all of our final pieces turned out so different! It doesn’t matter how many times I tried, Baymax ented up a much skinnier version of himself. So, how did I do? I had a lot of fun. Yes, I recognize that they aren’t going to be banging on my door to offer me a job, but I was proud of the fact that when I showed my drawing to my kids they immediately recognized who it was! 🙂 That says something, right? 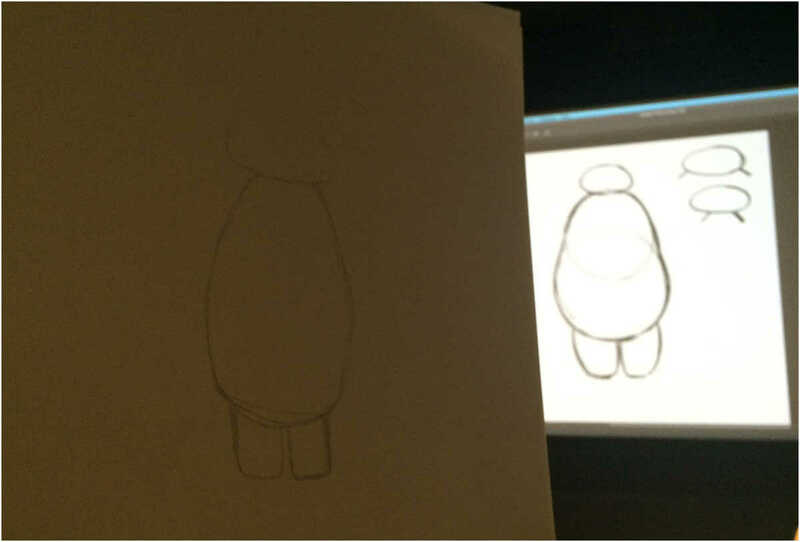 🙂 Baymax really is a pretty simple character to draw. 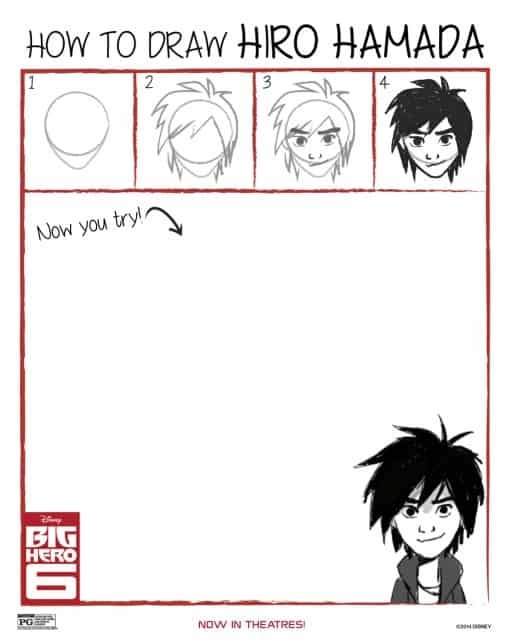 You can draw him too, by referencing the photo below drawn by Jin Kim. Add shade marks on his elbows, legs, feet and stomach with a line connecting from one side of his stomach to the other and you are done! If you need more help, here is a great video by Jin Kim teaching you to Learn how to Draw Baymax. Here are some fun Free Printables that teach you how to draw Baymax and Hiro! 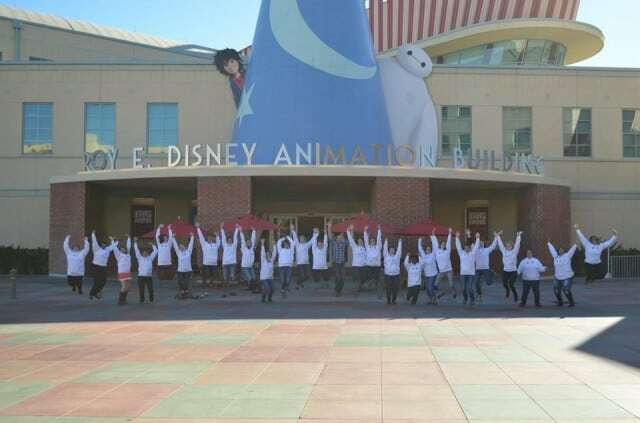 I had the opportunity to go on a trip sponsored by Disney. In return I am sharing my feelings and opinions with my readers. All opinions are my own.